Every MItzvah Celebration I get to be a part of, I fall more and more in love. I love the rituals, the traditions, the meaning behind the ceremony, the parties, and most importantly, the families. OHHHHHH, THE FAMILIES!!!!!! Each and every family I've worked with from Temple Beth Or has been warm, generous, kind, and just the best. The Kochman Family was no exception, believe me! Before the ceremony there were hugs and smiles, a little goofing around, and a lot of laughter. Andrew, our birthday boy, was a little nervous, especially about reading his Torah portion. But he NAILED it. He had a beautiful voice, he sounded strong and confident, and he had wonderful things to say about his family and friends. He rocked it! Now, the ceremonies may have some of the same traditions and prayers, but each party to follow has been so unique and FUN!!!! Andrew decided for an "Under the Sea" type of feeling. The kippahs were blue with seashells and he had a special tie to match, and the entire reception area was covered in underwater blue balloons! The party was held at Solas Nightclub in downtown Raleigh and it came complete with an incredible lunch, a rockin good time with tunes and dancers, a photo booth with amazing props, a frozen custard bar, champagne toasts, ring pops, and super fun socks to dance in. It was a BLAST!!! Everyone was drinking Shirley Temples, taking pictures, doing the limbo, and dancing away. SO. MUCH. FUN! 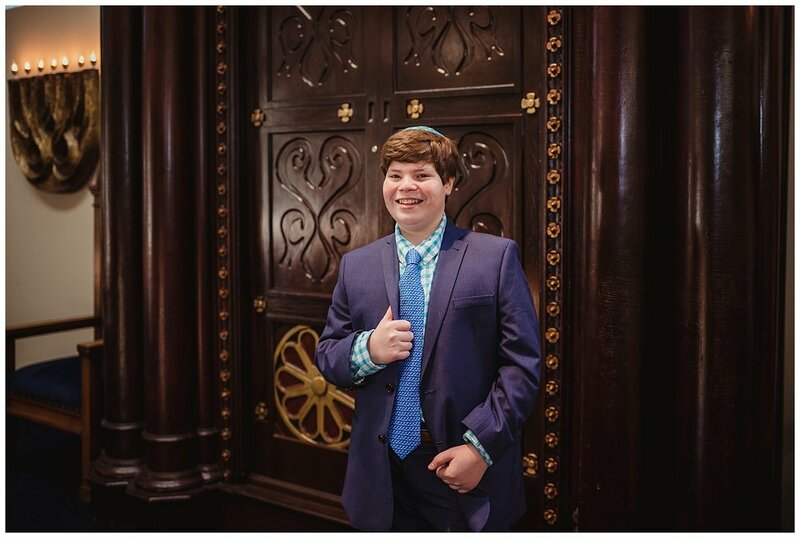 Andrew, Mazel Tov to you and your family on becoming bar mitzvah! It was a lot of hard work and dedication and you deserved all the awesomeness thrown your way. Congrats to you my friend, and thank you for letting me be a part of it! Scroll down to see all the amazing vendors who were a part of the celebration!